Sriz Beauty Blog: Maybelline Clean Express Total Clean Eye & Lip Make up Remover Review!!! 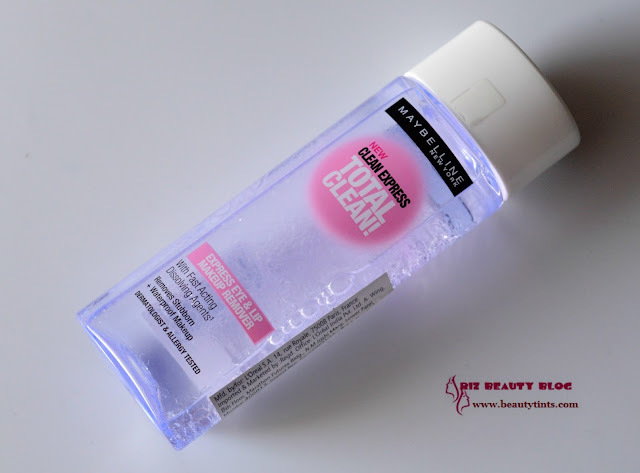 Maybelline Clean Express Total Clean Eye & Lip Make up Remover Review!!! 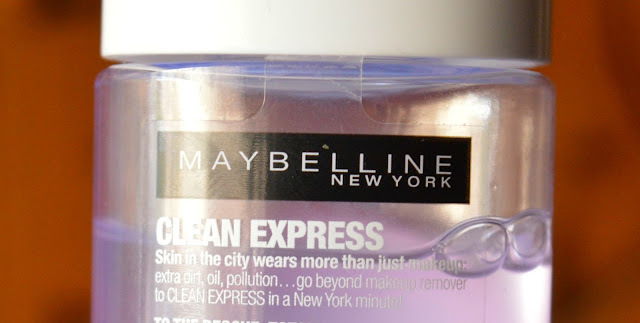 Today I am reviewing Maybelline Clean Express Total Clean Eye & Lip Make up Remover,which is my favorite Make up remover currently and which I bought recently along with the Fit Me Poreless Foundation which I reviewed few days back. 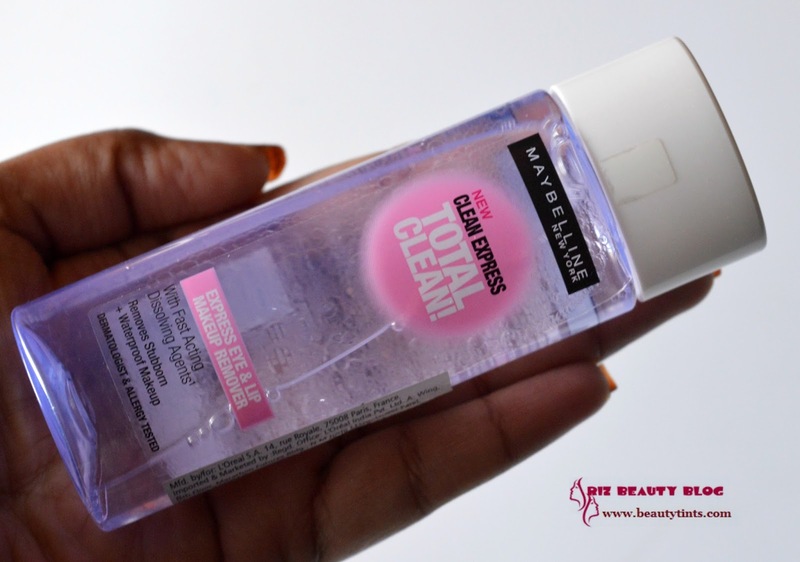 Packaging : It comes in a sturdy transparent bottle with a white cap. What the product Claims : Skin in the city wears more than just makeup,extra dirt,oil,pollution....go beyond make up remover to CLEAN EXPRESS in a New York Minute. 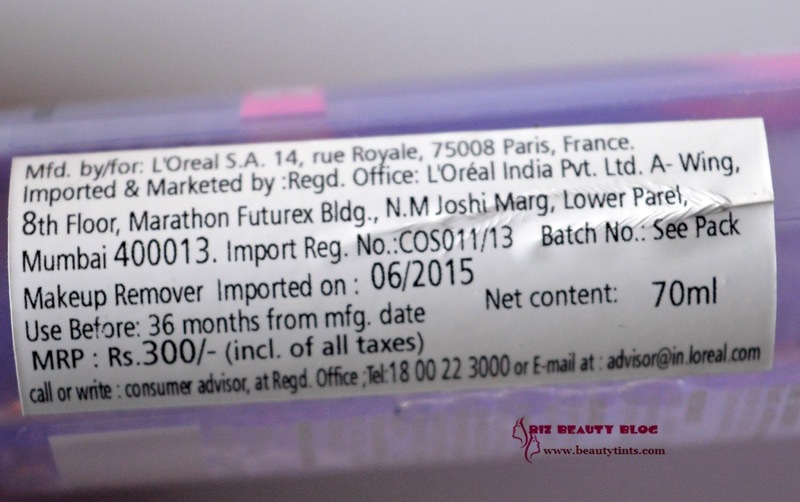 Directions for Use : Shake well to mix the two phases.Pour on Cotton pad and apply on eyes and lips. 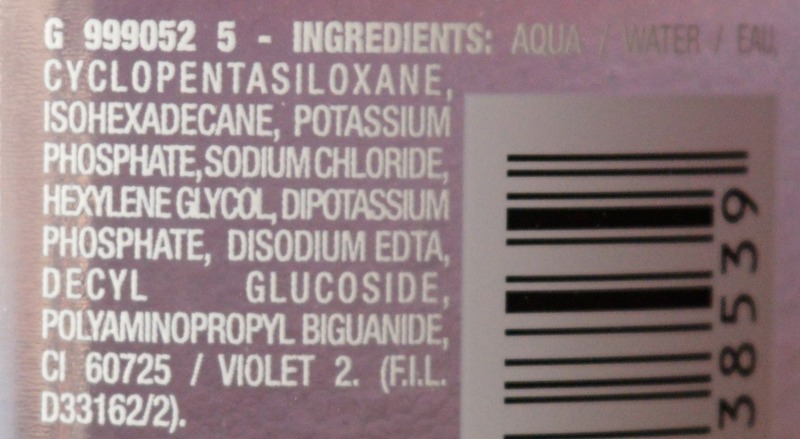 Ingredients : Aqua,Cyclo pentasiloxane, IsoHexa Decane, Potassium Phosphate, Sodium Chloride, Hexylene Glycol, DiPotassium Phosphate, Disodium EDTA, Decyl Glucoside, Polyaminopropyl Biguanide,CI 60725. 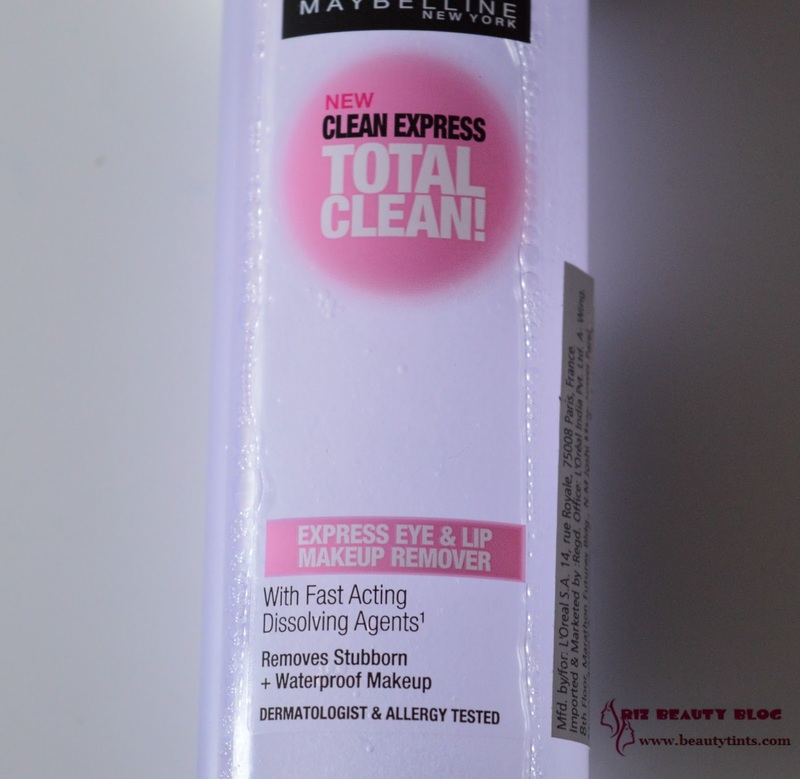 My Views On the Product : This Maybelline Total Clean Express Make up remover works wonderfully for both lips and eyes.It comes in a easy travel friendly plastic bottle with a white cap.It has an inner lid with a tiny opening which allows only the right amount of product with out wastage.The remover is a bi phased one with both oil and liquid layers.One needs to shake thoroughly so that both the layers gets mixed up well.When it comes to removing make up the most toughest job is to remove waterproof Mascara and eyeliners and this remover does it wonderfully and easily.I just pour the remover on a cotton pad and then gently place it on my eye area keeping my lids closed and lip area, leave it for 1 minute and then wipe off.All the stubborn mascaras and eye liners as well as lipstick comes out easily with out much effort and with out leaving any marks or stains behind .It has a very mild fragrance which is not at all disturbing.It can also be used to remove the face makeup as well.It removes all kinds of foundations ,blushes very effectively.As it is a bi phased one,it contains oil and so one needs to follow it up with a cleanser or a face wash.It is affordable when compared to many other makeup removers available in the market, which does the same job but some may feel it pricey for the quantity it comes.The best thing about this is it doesn't irritate or sting the eyes at all,even if the product enters into the eyes by mistake,so it can be used for removing kajal on waterline.As it claims it removes all the makeup very fast in a single swipe and the name 'Clean Express' is apt for it!!! 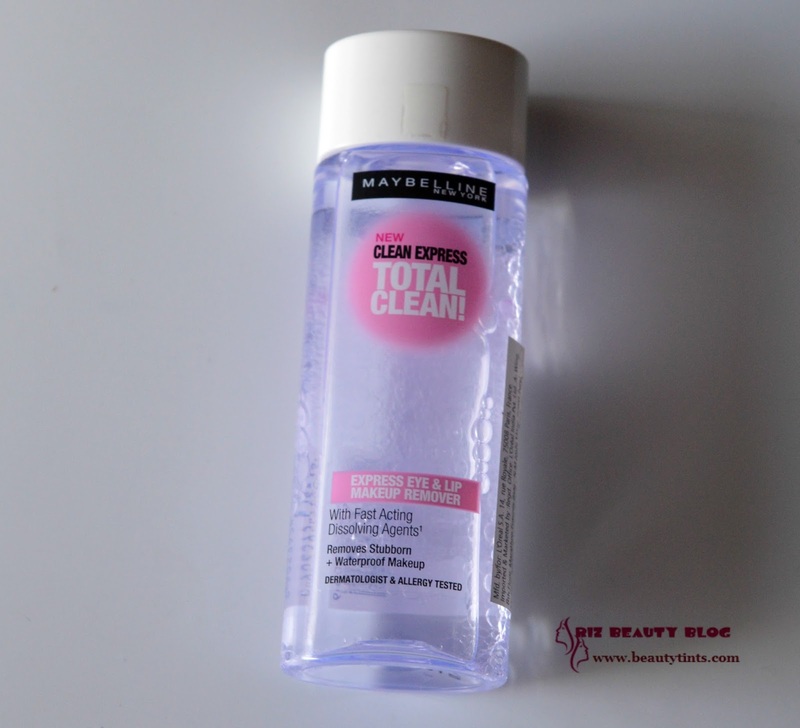 Final Conclusion about Maybelline Clean Express Total Clean Eye & Lip Make up Remover : This Maybelline Clean Express Total Clean Eye & Lip Make up remover is one of the best as well as affordable biphased makeup removers and the best part is it doesn't irritate the eyes...I would recommend this to all and those who wear makeup on a daily basis!! !